The Reverend Dr. Kathleen Price began serving as Interim Rector of St. George’s on May 7th, 2017. She was most recently the Interim Rector at St. Martin’s Episcopal Church in Williamsburg where she grew up, and for 15-1/2 years she was Rector of All Saints’ Church, established in 1642. 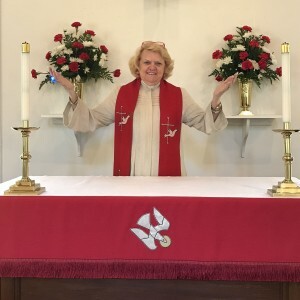 She has been associated with several historical churches: Bruton Parish; St. Paul’s, Rock Creek Parish, Washington, DC; and Grace Church, Yorktown where she served as Assistant Rector. Her late husband, the Reverend Dr. Geoffrey M. Price, was rector of St. Paul’s, Rock Creek Parish and taught liturgy at Virginia Theological Seminary for 30 years. Kathie has studied and traveled extensively including a course at St. George’s College in Jerusalem, two courses at the Maryknoll Institute of African Studies in Nairobi, and time in Ireland, England, Scotland, Italy, Spain, Greece and France. She returned recently from a 2 week trip to the Holy Land. Kathie has an undergraduate degree from UNC Greensboro, a Master of Education and Counseling from William & Mary, a Master’s in Divinity from Va. Theological Seminary, and a Doctor of Ministry from Howard University in Washington, DC. She has extensive experience in leading workshops, retreats, quiet days, days of reflection as well as liturgy, preaching and Christian Ed Programs. We are pleased and blessed to welcome Dr. Price to St. George’s and look forward to her service, ministry and guidance as we move onward in our search for a permanent Rector.